Ooh how exciting! Thank you! Now, this is not a joke or a story or a witty insult or a limerick, but these photos definitely made me smile, and I hope they do the same for you! I think my favourite is the fourth one down! It’s good to make people smile. And honestly, a random act of kindness makes ME feel great too. On the way home just now from a Green & Blacks book launch event, I sat on the tube next to a lady holding a pretty bouquet of lilies. I asked her whether they were for a special occasion and she said no, she’d just had a really stressful day at work and had got them to cheer herself up. When I got off a couple of stops later I dropped a couple of mini bars of chocolate on her magazine and said I hoped tomorrow was much better. I didn’t see her reaction, though she said a very surprised thank you, as I was stepping off the tube… but you know, whether or not it gives her a second’s extra smile tomorrow, it made me feel good! But she found him, och aye the noo said Wendy. Ok, scrap that och aye the noo line and insert……. But her pink wellies were incredibly trendy! Ah I just added this to my amazon wishlist the other week. It looks like it’d be really inspiring and great for ideas when I’m staring at the cupboard and contemplating making yet another variation of meat braised in stock. walking along the shore this week I noticed a lovely lollopy dog bounding towards me. As the dog jumped up on me his owbner was heard to remark “Don’t do that Steven”. Is it just me or does that make you laugh too? What a name for a dawg! So many good books, so many good tastes ~ I think I shall spend a lifetime enjoying them both ~ but which one first? who lived just outside Inversneckie. and wore pink wellie boots – that’s our Wendy! I’ve aye got a lot of jokes to tell, but a joke’s not the same without facial expressions, tone etc. So, I’ll tell you about a funny story. I’m aye saying the wrong thing – so this is just one of many stories! I thought that nobody noticed, but the laughter told me otherwise. I tried to keep my composure, but my friend was in the audience and had turn the brightest red I’d ever seen and looked like she was on death’s door, as I think she stopped breathing. I couldn’t help but join in. I laughed so much that I had to give up completely! At least now, when I make any presentation, the audience always pays rapt attention. Hopefully you’ve enjoy my story. might have been those b******s at the post office. Have you ever heard a screech owl? (If you’ve seen “My Cousin Vinny,” you may remember the screech owl in the movie.) I live in a rural area in the US, and until recently we didn’t have any close neighbors. What happened the first time my husband left town for a week? A screech owl parked itself in a tree right next to my porch and screamed every hour or so all night long. It was hilarious when it wasn’t terrifying. Fast forward 5 years, to a day last week. The screech owl was back, but it was far enough away from the house that in our bedroom with the windows closed we couldn’t hear it. Our female cat could hear it, though, and every time it screeched, she screamed for a half hour afterwards. I finally figured out what was setting her off when I moved to her side of the house to try to comfort her. I seriously question her sanity. Nothing would calm her down either. She would seem to be relaxing, but then the owl would screech, and off she’d go again. Of course, she’s pretty vocal and seems to like imitating area animals. She’s got a feline version of coyote howl. She does the rooster across the road. And when we had goat neighbors, she baaaaaaa’d. If you don’t believe me, we were headed out of town and had to tell our friends who were staying in the house to expect all sorts of bizarre sounds from her. When we got home, the friends said that they hoped we wouldn’t think they were crazy, but was it just possible that the cat was trying to sound like a goat? Yep, she was. Too bad I can’t get her to do it on command. Ok, this made me smile a lot (and also want to go to Costa Rica)- sloths! OK. Competition is now closed. Am contacting a guest judge for a second opinion as every entry made me smile. Winner announced tomorrow. Oh dear, I didn’t get mine in on time, but hopefully my latest post will make you smile anyway. Hooray! 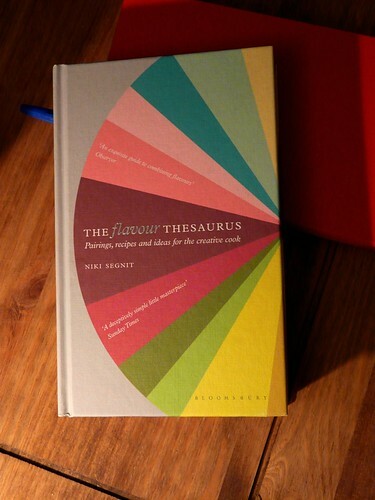 The Flavor Thesaurus arrived, and I absolutely love it. Thank you!